All over the world, picture stories are the stepping stones for children in getting to know the adventurous and joyful world of books, getting familiarised with the world of printed texts and grappling with the techniques of reading through taking short strides. This is true in case of India as well. 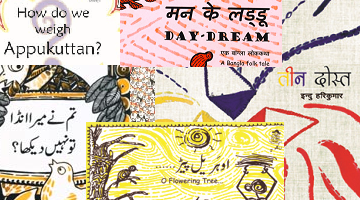 The books in this series cover an entire range of texts and stories for children in India; read-alouds for toddlers, short one-liners with articulate illustrations for the 4-6 years age group, and books that challenge and satisfy a more practiced reader. Once children are duly exposed this wonderful and adventurous experience, there is no need to look back! The children have gone off to the school, leaving the animals behind who are bored. Fortunately, a H..
किट्टू खो गया है... पर बेवजह झगड़ने वाले और बेतहाशा शोरगुल करने वाले दुनिया के सबसे अजीबोगरीब परिव..
कुदरत के रंगो से भरी कविता। ..
Little Bagha is proud of his mum the tigress Baghini. One roar from the tigress makes all the animal.. There are these simplest elements on the earth that nurture the most comp..
एक गडरिया बच्चा जो आज एक विश्वविद्यालय में प्रोफेसर है, अपनी जाति के लोगों को लामबंद करने ..
A newly hatched chick is following a duckling… Do they get into trouble? Beautiful and warm illustra..
Little Tinti thinks she is a cat! But her mother says that Tinti is her little girl. Read and find o..
What can you create with a line? In this book, you learn all about the magic of creation with lines ..
A rib-tickling story of day-dreamers who dream of buying a cow. Read to know more about this couple ..